It has been 3 years since version 1.0. 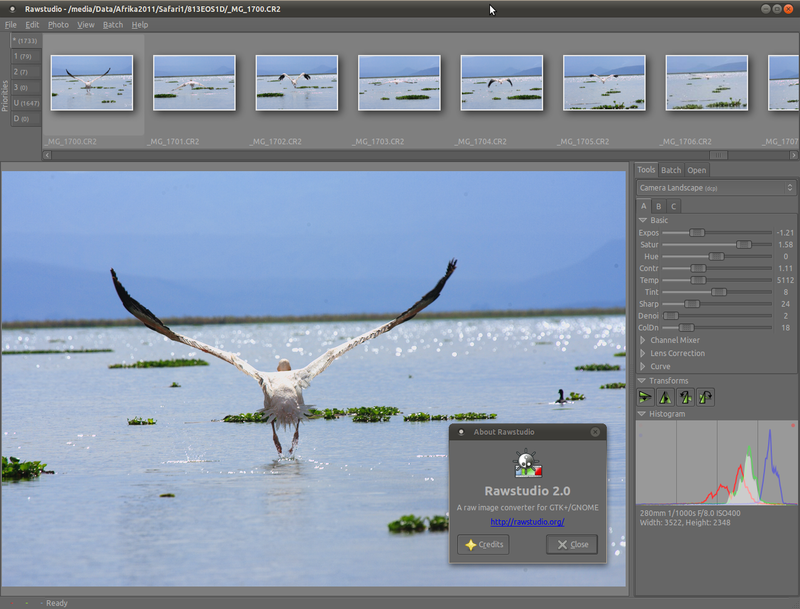 Thanks to our great testers and translators we are now very happy and proud to present the official release of Rawstudio 2.0. We think we have achieved a significant leap over the previous versions. We think we have achieved a level of operation, that will enable you to process a huge number of images quickly and easily, enabling you to get a high quality result you can share with everyone in a short amount of time. Our main focus in this version has been to have much more control over the color correctness and overall image quality. At the same time it has been a high priority for us to maintain a high speed of operations, so you can edit your RAW files even on netbooks and similar hardware. Rawstudio 2.0 ready for takeoff! At the same time we also feel that Rawstudio is now more usable out-of-the box. We have attempted to minimize the amount of “bumps” that new users should encounter when they try out the program the first few times. We hope we have gotten closer to this goal, and will continue this work in the future. And of course hundreds of small corrections and changes that didn’t make it into this list. We hope you will enjoy this new version. Again, we would like to thank everybody who contributed – with testing, feedback, test photos, translations and good spirit. Without you this release would not have been possible. Now go to the Download section and grab the version you’d like. Win, win everywhere! Thanks for all your hard work, guys. Any chance of seeing your at LGM in Montreal this year?? guys, rawstudio is best. can’t wait to test next version. thank you for sharing perfect things you making! Thanks a million for this release. It now supports my camera(eos rebel t2i). Works great with my canon T1i. Thanks for your hard work!!. First of all, great job with 2.0! I tried an earlier version in the past and did not really like it but now I am back to rawstudio. Below are some of my experiences, [hopefully constructive] criticism and suggestions, maybe they are of use. * My main annoyance are the sliders: they are *really* sluggish. When I move a slider the it becomes unresponsive and quite hard to use. I suspect the transformation calculation is started in the same thread as the interface? My pc is not very high end (dual core 1.6 ghz) but I do expect a slider to be usable on it. At the moment I use mouse wheel scrolling a lot because i know where the slider will end up and the manual input box for the detail. * Exposure: Images tend to look a bit flat when I use this tool. When the adjustment is very small it’s okay. * In general my raw images seem overexposed. The same image opened in ufraw and shotwell is fine. Maybe there is something wrong with the profile for my camera (Canon Powershot S90 simple)? Feels like the gamma is set too high. Anyway I can test this? * About the gamma, is there a way to manually set this? I cannot find it. I have a feeling I should be able to do this using the curve tool. But that one has strange issues, see below. I really like the ‘levels’ tool in the gimp, it is very easy to use. * Temp/tint: the reset buttons for temp and tint reset both tools, is this the way it is supposed to be? To me it is confusing. * Sharpen: The step size when using the scrollwheel seems too low to me. Something like 5 would be nice. Same goes for Denoise and Colour Denoise. * Mouse wheel scroll: Scrolling up on the slider decreases the value, but scrolling up on the number detail thingy next to it increases the value. Nice that scrolling on the number is more detailed, found this by accident but find it really useful. * Denoise: Hmm well I haven’t got very good results using this, just more blur. This is expected of course, but maybe there are smarter algorithms. Also it seems to segment the image into blocks and evaluate the needed correction per block which results in visible lines at block edges (for more aggressive denoise that is). * Colour denoise: This thing is amazing! * Curve: This thing has some weird behaviour. When you crank it all the way down some parts of the image get inverted or flip around to being light again, I don’t thing it is supposed to do that. Also it is very sensitive around the center which makes it hard to make small(ish) adjustments. As said above I do like the levels tool by the gimp, but of course the curve is more powerful. With the ufraw gamma curve it is easier for me to get the right result (and it does not have weird behaviour when you crank it down low). * Image context menu: It would be nice to have the keyboard shortcuts there as well. Also the white balance submenu does not list the ‘auto’ mode while the main menu does. * The white balence auto mode always produce images that are on the green side. * Lens correction: I could not get this to work, Some S90 things show up in the lens library but I cannot enable them. * Vignetting works really well! It does work on both images in split mode, not sure if that is intended. * It would be nice to be able to see both images 1:1 in split mode. * Some sliders display -0 after being moved back to 0. * It would be nice to have the load non-raw files option to in the file menu (like the type selector you see in many applications). Options could be “Raw files only” and “All images” or something like that. Whoah that’s quite a list and too little praise! Maybe some of the things are quirks of my pictures or stuff I did not figure out properly but I hope it gives an insight in what a user might encounter. * I am missing an option to keep the aspect ratio when cropping (and landscape/portrait for that ratio). * A red eye removal tool would be great, but a rather low priority I guess. If you want me to open tickets for some of the above (maybe they are already there, I did not check) please let me know. Congrats guys and well done! You’ve been doing really well in my opinion. You’re providing one excellent software. I honestly consider it one of the best FOSS. It made my shots look flabbergasting! All I know is that if I ever reach 21 and finally get a credit card, this project would be the first FOSS project that I donate to. wish i could get the install working on squeeze… lots of uninstallable deps.